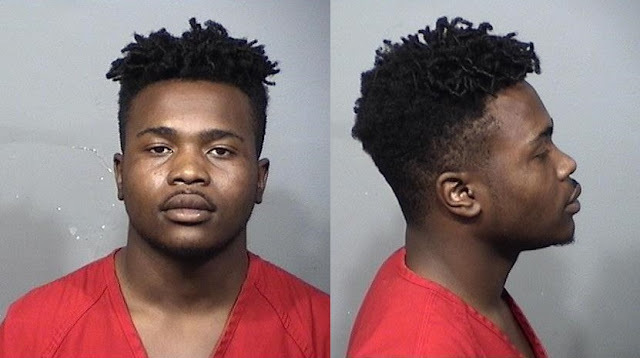 COCOA, Florida - The Brevard County GameOver Task Force has arrested 20-year-old Adrian Corice Johnson, Jr. of Cocoa, Florida for his alleged role in a botched robbery that led to the shooting death of Ladarius Bentley. On March 16, 2017, deputies responded to 3617 Brophy Boulevard in unincorporated Cocoa following a 911 call reporting that a person had been shot in the residence. When deputies arrived, they discovered Bentley, who resided at the house, deceased. Investigators say that Johnson, Jr. and Bentley developed a plan to rob Johnson, Jr.'s former co-worker, Mario Rivera-Verduzco, Jr., who was lured to the house under the pretense of selling drugs. After arriving at the residence, Rivera-Verduzco, Jr. was confronted by Bentley who was armed with a handgun. A struggle ensued over the firearm where Rivera-Verduzco, Jr. was able to gain control of the gun, shooting Bentley who was mortally wounded and died at the residence. During the altercation, Johnson, Jr. fled the scene. The Brevard County Sheriff's Office determined that Rivera-Verduzco, Jr.'s actions during the incident were justified and he will not face charges in the shooting death of Bentley. Anyone who may have information about this Homicide is asked to please call Agent Joe Martin of the Brevard County Sheriff’s Office Homicide Unit at 321-633-8413 or CRIMELINE at 1-800-423-TIPS (8477). All calls to CRIMELINE are confidential and callers can remain anonymous and be eligible for a reward.